When crafting or playing in the Weird West, it’s often handy to have some inspirational tunes spinning in the background. 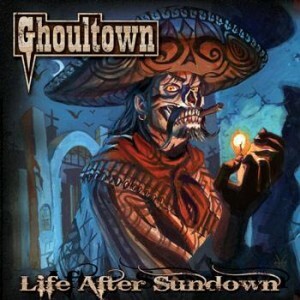 The band that I immediately think of for Weird West warbles is Ghoultown. Their catchy hymns manage to strike a particular chord of the strange and horrific that is perfectly suited to a Weird West adventure. From tales of drinking with the dead to serial killers aboard trains, you can never go wrong firing up a track from one of their albums. The flavor of their music is firmly in the realm of rockabilly/psychobilly; which means you get a fusion of hard rock riffs and lyrics mixed with blues and classic western guitar twang. Their is also a strong influence from south of border with a strong influx of mariachi inspired brass. Their style eventually attracted the Mistress of the Dark, Elvira, to seek a theme song and video from the psyhobilly rockers from Texas. And for Vampire fans out there, their gig posters actually appeared in the 2004 Vampire the Masquerade: Bloodlines PC game. Well, enough of my wailin’s, I’ll their music speak for itself. I agree, I own both the original and the Undead Nightmare OSTs. They’ll both be on an extended playlist post coming Monday. They are just awesome! Thanks for turning me on to this band– I can’t believe I’d never heard of them before. No problem, I’m glad you like them! I keep waiting for a local show so I can see ’em live.